This book is the first in our magical appetizers series. This series will be dedicated to a set of small "idea" books and single effect manuscripts. The idea is to spark creativity or offer powerful clever thinking in small packets to get your creative juices flowing. The Complete 10 Minute Guide To Rubber Chicken Soup For The Performer's Soul And Other Ideas To Whet Your Creative Appetite. 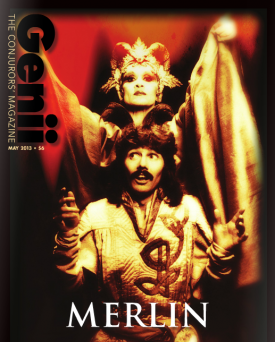 In Dustin' It Off, Julie Sobanski and Dean Montalbano revisit their 1980/90's Genii column Tarbell Treasures. In that old chestnut, the authors would take an old outdated item from the Tarbell Course In Magic and dust it off with a new twist, idea or presentation. Here, for the first time in once place are many of those routines, plus some new ones never seen before and several articles dedicated to magical thinking. Please note that the driving intent behind this book is to spark creativity and show you how older effects can be dusted off. 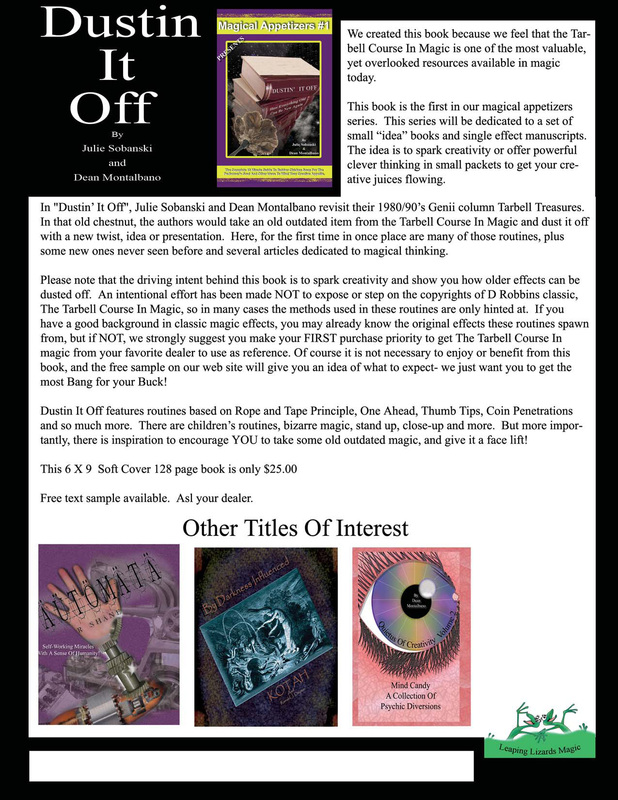 An intentional effort has been made NOT to expose or step on the copyrights of D Robbins classic, The Tarbell Course In Magic, so in many cases the methods used in these routines are only hinted at. If you have a good background in classic magic effects, you may already know the original effects these routines spawn from, but if NOT, we strongly suggest you make your FIRST purchase priority to get The Tarbell Course In magic from your favorite dealer to use as reference. 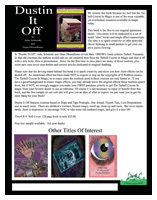 Of course it is not necessary to enjoy or benefit from this book, and the free sample on our web site will give you an idea of what to expect- we just want you to get the most Bang for your Buck! Dustin' It Off features routines based on Rope and Tape Principle, One Ahead, Thumb Tips, Coin Penetrations and so much more. There are children's routines, bizarre magic, stand up, close-up and more. But more importantly, there is inspiration to encourage YOU to take some old outdated magic, and give it a face lift! You can view a sample of the first few pages HERE. Click on the following thumbnail image to get a full-size printable flyer for the Dustin' It Off!